> The Hockey News continues their logo rankings today, with the CCHA. For those who are unfamiliar with this, THN does a league-by-league breakdown, everything from the NHL, to the NCAA, to the OHL, and ranks each teams logo by conference. For the CCHA logos, THN says Miami has the third best. 3. Miami RedHawks: formerly the Redmen, Miami of Ohio rebounds with a strikingly intense hawk. A few things here. It’s great that we’re so high up on the the list…but “Redmen“? Really? Could they not print “Redskins,” or are they just that sadly misinformed? If you’d like to check out the rest of the THN logo ranking list, it can be found here. > As it’s hard to find news during the off-season months, I recently had the chance to conduct an e-mail interview with Coach Blasi. Everything from the OOC schedule to the power-play is addressed. Hope you enjoy it! Feel free to send any feedback. With the official beginning of the 2008-2009 season still more than a month away, light work for the RedHawk icers has already begun. For those curious as to how the off-season schedule works, Rico says that, with the exception of a month or so, the season…never really ends. Planning is a topic of which the RedHawk coaching staff has undoubtedly become very familiar with since the season-ending loss to Boston College in the quarter-finals of the 2008 Frozen Four tournament. As the team was already prepared to lose seven seniors due to graduation, juniors Alec Martinez and Jeff Zatkoff both decided to forgo their final year of eligibility and sign with the Los Angeles Kings, the rights holder to both players. With the Martinez’ departure, the RedHawks lost four defensemen, three of which were a consistent presence on the blueline, leaving only seniors Kevin Roeder and Ray Eichenlaub, as well as sophomore Vincent LoVerde as the top 3 defensemen. While defensive pairings obviously haven’t been decided upon yet, Blasi says the returning RedHawk blueliners will have a lot on their shoulders and certainly expects Michael Findorff to be in the mix. Another area where the RedHawks were hit hard in…more specifically, senior leadership. Gone are captains Ryan Jones and Nathan Davis and while it’s a very tough task to replace a presence like Jones both in the dressing room and on the ice, Blasi, once again, looks to the senior leaders to do just that-lead…and choosing a captain to replace Jones, Blasi says, wasn’t an easy decision. No, the new face behind the bench this season isn’t Jeff Blashill with a makeover. It’s new RedHawk assistant coach Brent Brekke. Brekke, who had spent the last several seasons with Cornell, replaces Blashill, who left Miami earlier in the summer to become the head coach/general manager of the USHL’s Indiana Ice. With Blashill now in the USHL, it could be surmised that more Ice alums could be wearing red and white during their college years. Regardless of where the recruits come from, Rico feels very good about his coaching staff- past and present. Miami vs. North Dakota…regular season? Yes. We’ve all either heard the comments, or made the comments about the out of conference schedule as of late. Once again this season, Miami will face RPI, and Vermont in weekend series’ and will see Clarkson in the Ohio Hockey Classic. Blasi has his take on the OOC schedule and to those who want to play bigger and better schools? Relax. It’s coming. -Rico feels very good about the power play over the past 5 years. He feels that it’s more important to score timely goals, while on the PP and for the most part they have done that. -Expect a “competition” if you will, for the number one goaltender job. Rico also says that we will probably see both Reichard and Knapp early on in the season, much like he did with Effinger and Zatkoff in the past. > I’m trying to line up an interview with Coach Blasi, for the blog here. If we can set something up, I’d love to hear whats on your mind for the upcoming season! Click on the envelope to the right to e-mail me, or post them in the comments section so I can add them to the list. I’ll keep you updated as to whether or not I’ll be able to speak with him. 8/5/2008, 1:23AM Update: Still nothing back from coach. I’ll keep trying. In the meantime, let me know what’s on your mind! Only one question so far. Keep ’em comin’! 8/11/2008, 3:40PM Update: Just heard back from Rico, and sent him the questions. Stay tuned for the interview in the coming days. > Ryan Kennedy over at The Hockey News, has put together a list of players from different organizations, that have looked impressive thus far in development camps, rookie camps, etc. Miami alum Jeff Zatkoff received a mention, with the LA Kings. 5. Jeff Zatkoff, G – Miami RedHawks (CCHA): The now former RedHawk turned aside all 25 shots he faced in the Kings’ scrimmage game, including a penalty shot. With Zatkoff, Jonathan Bernier and Jon Quick, the Kings will have their choice of young hot goalies for years to come. Drafted 74th overall by Los Angeles in 2006. Good to see Zats doing well. He has a great chance at making the big club, but I believe he’ll start the season in Ontario and quickly move up to Manchester. It all depends on who LA wants to keep on the main roster, whether it be Erik Ersberg, or Jonathan Bernier. Rosemont, IL – The Chicago Wolves have re-signed defenseman Brian Sipotz, a member of the 2008 Calder Cup Championship team, for a fifth season. The 26-year-old blueliner appeared in 21 of 24 Calder Cup playoff games en route to last season’s title, posting four assists and 14 penalty minutes. He also skated in 54 regular season outings, notching a +10 plus/minus rating and five points (G, 4A). Overall, the South Bend, Ind., native has notched 32 assists, 39 points and 130 penalty minutes in 259 career American Hockey League games with Chicago, spanning four seasons (2004-2008). The 6-foot-7-inch, 248-pound defenseman also racked up six assists and seven points in 47 career postseason matchups with the Wolves, which includes two trips to the Finals (2005,2008). 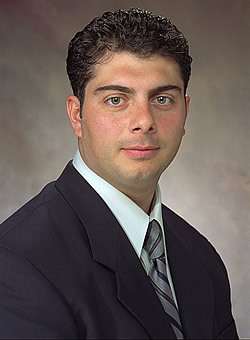 Prior to joining Chicago, Sipotz played four seasons at Miami University of Ohio (2000-2004), tallying five assists and 139 penalty minutes in 119 matchups.